The nest cradle was a participatory piece conceived from a visceral impulse of care, protection, and motherly nourishment. The sticks were gathered from the flood detritus by the river; I reflected on the steadfast intentionality of nest-building birds. The yarn brought children, their parents, and a welcome homeliness to the piece. The rockers I cut from scraps of plywood at the shop, carefully sanding and finishing small pieces that would otherwise have been thrown out. I wanted the cradle to absorb as much benevolence as possible, to be a channel by which these good intentions could reach those who need them most. 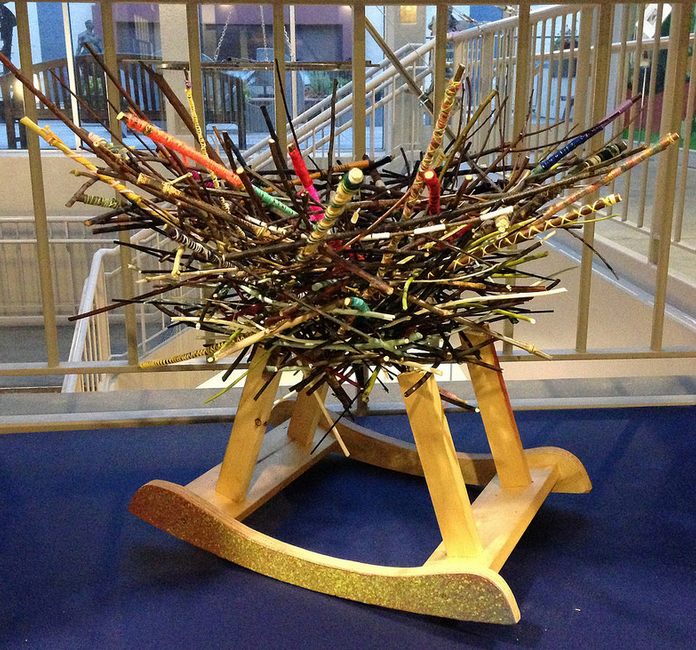 The piece was created for The Cradle Project, a Firelight Foundation project, and was co-created by visitors to the Santa Cruz MAH on February 8, 2014. It was on display with other cradles until March 22. This and other cradles were on display from April 17-May 24 at Alter Space in San Francisco.